Tehran lights and the Caspian Sea visible from the space through clouds. 21 July 2013. Photo taken by Karen L. Nyberg, American astronaut. She is currently in Expedition 36 on the International Space Station. Tehran is indeed beautiful and a mega-metropolis. 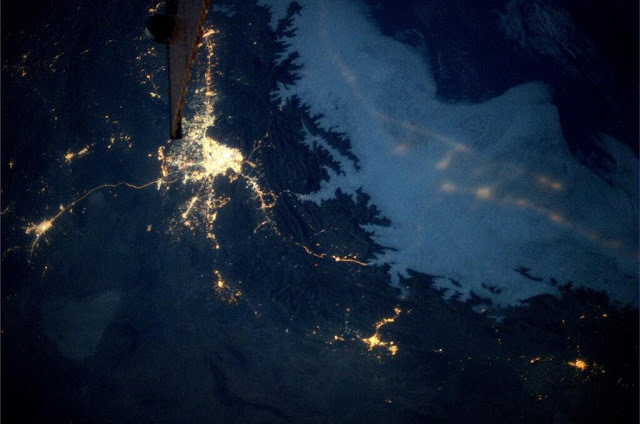 Iran is blessed to be so energy rich that can light up the night and seen from the high heavens. That sea is way off the photo. and be photographed by a citizen of a technologically advanced nation.